Villa Cristo Rei is placed on a cliff above the Garajau Natural Sea Reserve. This wonderful villa is presents an uninterrupted 180º view over and across the Atlantic Ocean. This 2 bedroom cottage is located in Fajã and sleeps 4 people. It has WiFi, a garden and barbeque facilities. Private heated Pool; sea views; suitable for families. Cozy space for a well spent days in a rural environment, with beautiful views of the landscapes, mountains and valleys of the quiet village of São Vicente on the island of Madeira. This modern holiday apartment is located in Caniço, one of the most beautiful sites in Madeira. Thanks to its mild temperatures. This 3 bedroom villa with swimming pool is located in Garajau and sleeps 6 people. It has WiFi, a garden and barbeque facilities. This 2 bedroom apartment with swimming pool is located in Săo Gonçalo and sleeps 4 people. It has WiFi, air conditioning and barbeque facilities. 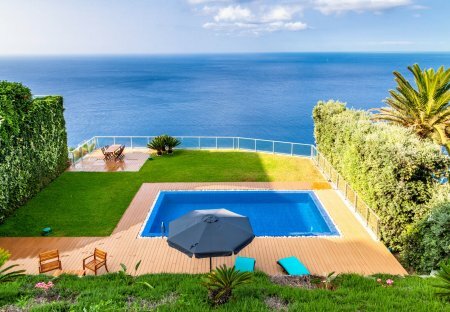 Morning Star Villa is one of the finest luxury villas in Madeira. The property is located in Arco da Calheta on the south western coastline of Madeira, one of the sunniest areas of the island. Villa with stunning sea views. Swimming pool heated with sunbeds. Villa is very well equipped with modern furniture. WiFi and air conditioning available. This 1 bedroom apartment with swimming pool is located in Săo Gonçalo and sleeps 2 people. It has WiFi, air conditioning and barbeque facilities. This 2 bedroom villa with swimming pool is located in Farrobo and sleeps 4 people. It has barbeque facilities, parking nearby and a gym. The villa is near a beach. In a peaceful and solitary area with a pleasant climate all year, spectacularly panoramic view to the sea and mountains. Price reduction for occupancy of less than 8, please ask for quote.